Hawick councillor Stuart Marshall at the Wilton Lodge Park war memorial this week. Outrage has been expressed by police and councillors after vandals set alight a wreath dedicated to Hawick’s war dead in the town’s Wilton Lodge Park. 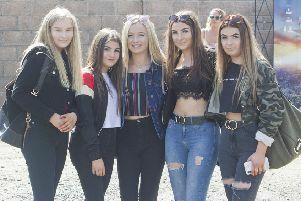 The perpetrators of the act of desecration at the weekend are “beneath contempt”, said Watson McAteer, town provost and a councillor for Hawick and Hermitage. Mr McAteer, an ex-police commander, called for a thorough investigation to ensure that the culprit or culprits are brought to justice. That was a plea taken up by Inspector Carol Wood, of Hawick police station, who said: “We are continuing with our inquiries to trace those responsible for the disrespectful act of vandalism at the Wilton Park War Memorial and would urge anyone who saw anything suspicious between Saturday, September 30 and Sunday, October 1 to contact us immediately. Fellow Hawick and Denholm councillor Stuart Marshall believes this latest vandal attack is part of an alarming rise in anti-social behaviour in the town. He said: “As a ward councillor, I am appalled to have learned of the recent act of vandalism at the Wilton Lodge Park war memorial. “Wreaths have been burned that were laid in memory of the fallen at Gallipoli, and this is just a shocking act which will outrage the community. “This latest act of vandalism within the town highlights how serious an issue we have within our community. “Recently, our town has been subjected to several businesses being forcibly entered, including charity shops of all places. Vehicles have also been broken into, and now someone has stooped to an all-time low by targeting our cenotaph. “Hawick is extremely precious about our war memorials and very proud indeed of those who have paid the ultimate sacrifice, so you can understand why our community is appalled and angered by this latest crime, and I appeal to anyone with information to come forward. Mr McAteer cited falling police numbers as a factor in the recent spate of crimes in the town. The retired police commander added: “I suspect that the people of Hawick will be outraged by this. “I believe there is a general feeling that the community is not receiving the level of policing they expect. “It is important to emphasise that most I speak to don’t blame the officers on the street in Hawick, rather they point the finger at Police Scotland and the hierarchy who have allowed policing numbers to seriously decline in this area. “Clearly, the incident at the war memorial is not necessarily something the police could prevent. However, I believe the community is looking for a thorough investigation that will result in the culprits being caught. “What has happened this weekend has been a perfect disgrace, and an obviously small group of individuals who care nothing for our community should not be allowed to bring our town down. Typically, the act of wanton destruction brought out the best in townsfolk. As news of the incident spread on Facebook and other social media forums, Teries arrived at the memorial to lay flowers to replace the wreath set alight. And the town’s Sainsbury’s supermarket donated a new wreath to be laid at the scene.